Do YOU make the best soup in Perthshire? Soup Back Story - is there an interesting story to go with the soup? How To Enter Your Soup – And What You Can Win! There are two competition categories – Under 18 and Over 18. Please state clearly which category you are entering. Send your recipe into Giraffe Trading Co by midnight on Sunday 11th November. All finalists will be invited to attend the Zuppa! Festival event on Sunday 18th November from 12noon to 4pm where they can chat to the public and encourage votes for their soup! Public voting will determine the winner who will be announced at 4.30pm by the Provost. The winning recipes will have their soup photographed at Violet Studios by Gill Murray, Food Photographer and Stylist, to be featured as the recipe of the week right here on our award-winning online mag. 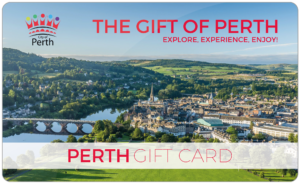 The winner will also receive a fantastic £100 Perth Card to spend in participating Indie retailers.